Within evangelical Christianity there are many different views about how and when God created the universe and humans and about who Adam and Eve were. 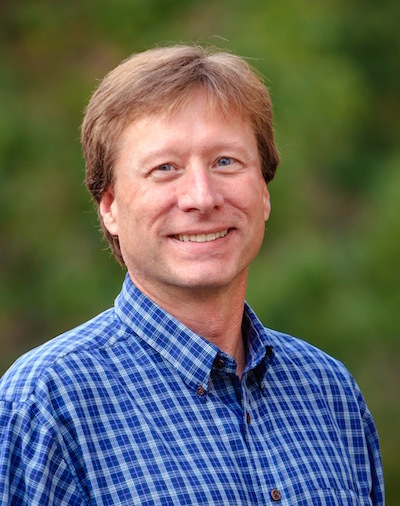 Very generally, we can categorize these beliefs into three options: (1) Young Earth Creationists (YEC) who believe that God created the universe about six thousand years ago and would deny that the big bang or macroscopic evolution occurred, (2) Old Earth Creationists (OEC), also called Progressive Creationists, who would say God used the big bang to create the universe about 14 billion years ago but did not use the process of macroscopic evolution to create humans or other life, so that God has supernaturally created the major classes of life over the last 4 billion years, and (3) Evolutionary Creationists (EC), also called Theistic Evolutionists, who would say that God used both the big bang and macroscopic evolution to create the universe and all life, including humans. I personally believe that all three of the above options could be defended biblically (which I will discuss in a later blog post). I would currently classify myself as an Old Earth Creationist because I believe that the scientific case for the big bang is indisputable, but I don't believe that the scientific case for evolution is conclusive or compelling. So biblically, I could accept and defend any of the above options but scientifically I can only defend the second option at this time. 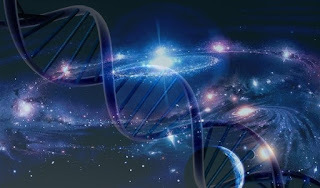 Over the last two blog posts I have presented my opinion that the current genetic and archeological scientific evidence is consistent with Adam and Eve living about 50 thousand years ago and being the first two humans and the sole genetic ancestors of all humans. 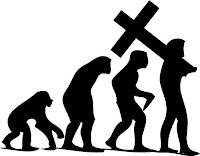 I have also stated that almost all Christian and non-Christian scientists who study human ancestry would not agree with me as to that being the most likely scenario, or maybe even a viable scenario. So what are the various options for Adam and Eve that are held by Evolutionary Creationists and how do those options fit into the biblical narrative? I'll discuss the answer to the first question in this blog entry and the answer to the second question in the next. 12 to 6 kya [kya means "thousand years ago"], when civilization and agriculture arise, then spread quickly across the globe. About 70 to 50 kya, with the rise of behaviorally-modern humans. About 100 to 300 kya, with the rise of anatomically-modern humans, also known as Homo sapiens. About 500 to 700 kya, with the common ancestor of Neanderthals, Homo sapiens, Denisovans, and likely some other hominins. I think that according to the Bible a human is a person created in God's image with a spirit that can commune with God. I think that definition is fairly unambiguous from a scriptural point of view. I also believe that it is possible that the first three definitions above could ultimately converge to a single point in time about 50 thousand years ago (50 kya) and that would be the time when a single human couple would exist and be the genetic ancestors of all humanity. However, as stated earlier, my opinion would not be supported by most scientists who study the genetic and archeological evidence. For me to determine what is true I must try to understand and interact with views and opinions of others, even if I don't personally adhere to those views. It is always possible I may be wrong and I may have to change my view as further evidence is uncovered and discoveries are made. So for the sake of discussion and completeness, let me present four possibilities that are held by Christians who study the genetic and archeological evidence for human ancestry and history. The first option call sole-genetic progenitorship would say that Adam and Eve lived about 500 to 700 thousand years ago and were indeed the genetic ancestors of all humans, but also of all other close relatives of humans like Neanderthals and Denisovans. From a scriptural point of view I would think that means that all of those hominins would be spiritual beings since they were the offspring of Adam and Eve. The second option called the genetic-interbreeding progenitorship would say that Adam and Eve lived about 200 thousand years ago and also were the genetic ancestors of all humans. This view would fit easily into a traditional biblical view of Adam and Eve as the first humans and the ancestors of all humanity. The caveat is that it would also imply that some of Adam and Eve's descendants had sexual relationships with non-human species like Neanderthals in order to explain the small amount of Neanderthal DNA in the human genome. The third option, called sole-genealogical progenitorship is a little more technical. It makes a distinction between genetic ancestry and genealogical ancestry. 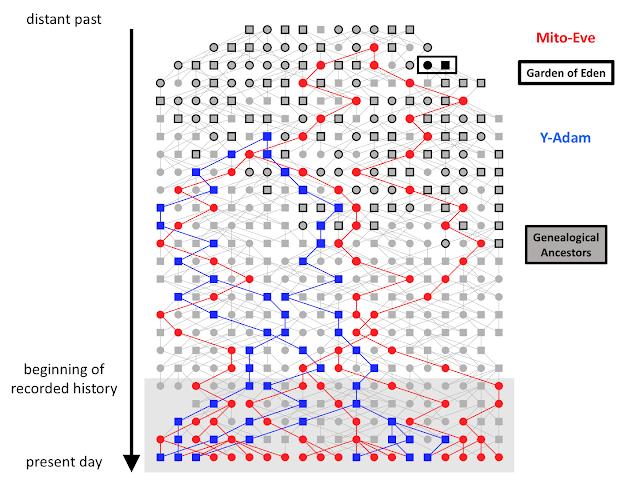 Genetic ancestry has to do with the story that our genes tell us about our ancestors and where we came from. Genealogical ancestry has to do with our genealogical history. The two are not the same. Consider that every human has 4 grandparents, 8 great-grandparents, 16 great-great grandparents, etc. If you go far enough back in history you will find that you have so many ancestors that everyone in the world has some ancestors in common. So even if there were always many thousands of humans in the world so that each human would have a different genetic history, we would find that all human genealogies ultimately have the same people in common. The chart below illustrates this idea from a theological perspective.2 A literal Adam and Eve (shown as the dark circle and square in the chart below) could exist among a human population of people and eventually all of humanity could be a genealogical descendent of Adam and Eve even though all humanity would not be genetic descendants of Adam and Eve as a single human couple. Such a genealogical pair of ancestors could exist even 6000 years ago and by now all of humanity could be the genealogical descendants of Adam and Eve. The fourth possibility could co-exist with any of the above three ideas or could stand alone. It is the idea that Adam and Eve were a representative couple among a population of humans and that they may or may not be the genealogical ancestors of all humans. In this proposal Adam and Eve serve as a federal or representative couple and their actions have consequences for all of humans. Just as in a republic government, where the people vote for representatives who act on their behalf, Adam and Eve could have been a representative couple acting on behalf of all humanity. In such a scenario Adam and Eve would most likely have existed about 6000 years ago. They could have been a couple that God chose to reveal himself to them in a specific and unique way. He could have placed them in the garden and had unbroken fellowship with them. They were chosen to act on behalf of all humanity and their actions as representatives would affect all humans. 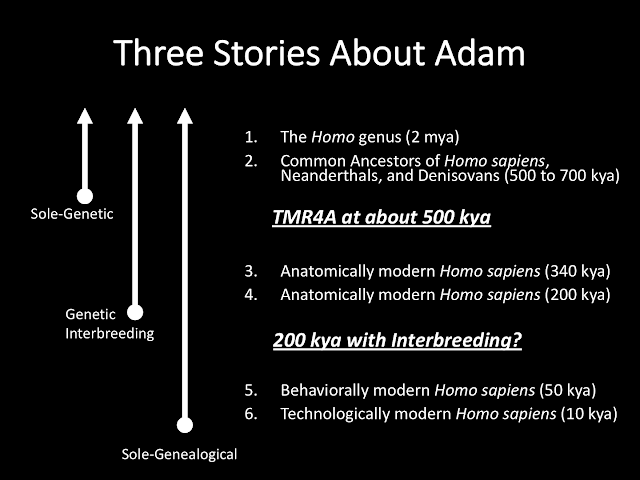 Only the first two scenarios would fall into the traditional understanding of Adam and Eve as being the first two humans, a single pair of humans, and the genetic ancestors of all of us. The first option would imply that all hominins related to homo sapiens are human as well over the last 600,000 years or so, and the second option would imply that some humans had intimate relationships with non-human hominins. Both of those scenarios also would place Adam and Eve long before modern human behavior or modern human civilization seemed to develop. The other two options fall outside the traditional biblical interpretation of Adam and Eve. We'll explore how those and other options may fit biblically and theologically in the next blog post. Addendum (The paragraph added after the original post): Although this entry is called "Adam and Eve and Evolutionary Creation" none of the four scenarios require an evolutionary past. They would all be compatible with a special creation of Adam and Eve with no evolutionary ancestor at the timescales given in the article. However, all of the four scenarios are derived using the same genetic clocks and timelines that are used by evolutionary creationists to date human origins and ancestry, but all four scenarios are actually compatible with both OEC and EC. Mike, just saw this. Excellent article. Thanks for engaging deeply with this.